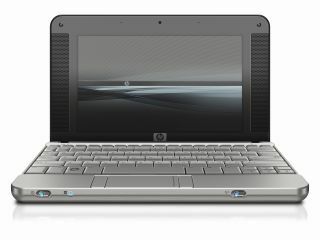 HP has spilled the beans on its Eee PC rival – and it runs Windows Vista Business! The new micro 1.27kg lappy will also be available with Novell SuSE Linux and will have a price point of £299, though that annoyingly doesn’t include VAT. Like the new generation Eee PC, the Mini-Note boasts a large 8.9-inch WXGA display as well as Wi-Fi and Bluetooth. The machine also has a smart anodised aluminium shell. Silicon manufacturer Via announced this morning that its C7-M ULV processor powers the new machine, not Intel's new Atom chip. The machine also has a keyboard that HP says is 92 per cent full-size. Er, right. Two batteries are available: 3-cell with up to two hours and fifteen minutes of battery life; or 6-cell for up to four hours and thirty minutes of battery life. "Don't be fooled by its size; this small wonder is a full- functioned notebook PC with an impressive combination of features", said David Wright, vice president and general manager, Commercial Products, Personal Systems Group, HP UK and Ireland. But he would say that, wouldn't he.